No giants, but schooling bass action can be incredible in the fall. This mild November day produced plenty of keepers with spinnerbaits and Rat-L-Traps near the mouth of a creek. Louisiana has several great freshwater fishing lakes that offer a variety of species like bass, bream and catfish. Also, don’t forget the excellent crappie fishing (white perch in North Louisiana, sac-a-lait in the South). While many are associated with high-powered bass boats screaming across the water, they also offer great kayak fishing opportunities. Many double-digit bass have been taken in these lakes, some within sight of the launches. These lakes have been stocked one or more times with a variety of gamefish and bait species to enhance the populations and fishing opportunities. From limits of schoolies to the ever-present chance for a lunker, take your pick and give it a try. Such iconic spots like Toledo Bend, Caney Creek, Lake D’Arbonne and many others are typically under-utilized by kayak anglers, but are quickly catching on. Other less popular, but still-productive lakes, include Chicot, Poverty Point and Valentine, and are all good kayak-fishing choices. Most of these lakes are full of draws and drains that carve out small pockets and fingers with many varied coves. Some have docks an piers, providing additional structure other than the natural shorelines and flooded timber. All have places that offer protection from big water areas, especially during windy cold fronts. Limited by their human-powered range, many kayak anglers stay away from these big water areas believing they can’t adequately cover enough ground or get to where the fishing is good. However, as many experienced ‘yak anglers have learned, fish do not know where the boat launch is. Therefore, when the bass boats crank up their couple-hundred horsepower engines to scream toward parts unknown, just smile and wave goodbye. Start fishing immediately after hopping in the kayak, and you literally may never get out of sight of the launch. So far this year, fall has been non-existent — who knows when winter will arrive? The fish have remained in extended summer patterns across the state, but after a couple of cold fronts they will begin moving out of the main lake areas and staging near creeks, points and coves. Schooling bass are typically feeding on shad or other small baitfish. Lipless crankbaits like this Rat-L-Trap can be used at all depths by varying the fall and retrieve speed to get to where the action is. For fall and winter fishing, the patterns on these lakes change. The first thing to look for are signs of schooling bass. Bass start herding baitfish into isolated schools where they can maul the forage. This is oftentimes given away by surface action as the bait tries anything to get away from the feeding bass. If you locate such a spot, paddle upwind and let the kayak drift slowly toward the activity. Make your casts as far as possible. You want to be part of the action, but not in the middle of it. 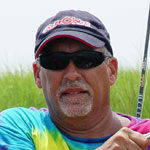 Watch for jumping bait to get a handle on what size lures to throw. Natural shad colors in the appropriate size best match what they are feeding on. 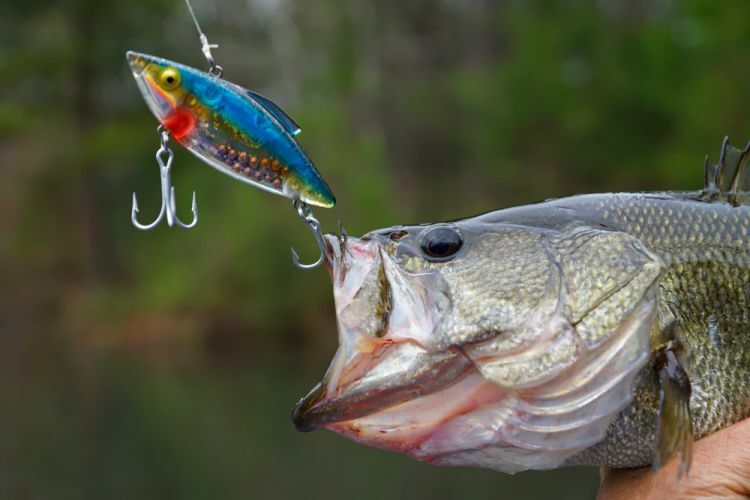 If the frenzy is visible on the surface, throw topwater lures or shallow crankbaits. When the visible action slows, it doesn’t necessarily mean that the feeding is over. Throw a spinnerbait, Rat-L-Trap or deep-diving crankbait to see if the bite is still on at deeper depths. After picking off a few fish, the bite may stop. However, don’t abandon that particular area unless you see nearby action. 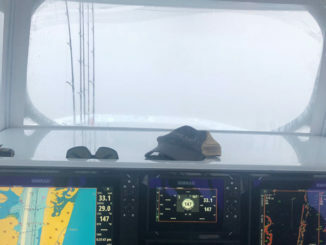 Wait things out for a little while, as bass will usually start herding the bait again, and the scene will repeat itself. On milder days, the bass may move shallower up onto flats, where plastic worms and even topwater plugs will be productive. However, after a cold stretch, look for deeper water and fish stacked up at particular depths where they are comfortable. 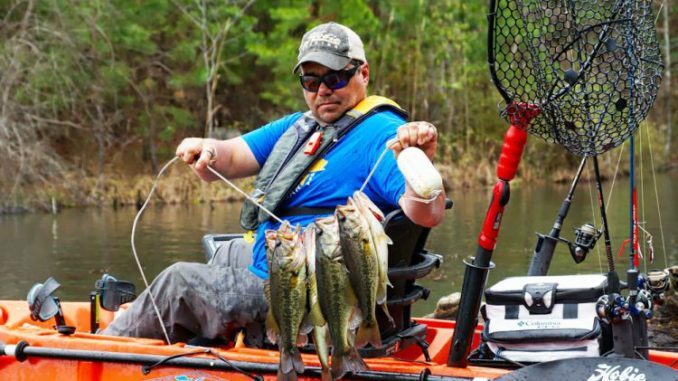 While kayak fishing is considered a minimalist sport, many serious kayak anglers outfit their rigs with all the equipment of a Bassmaster champion. One in particular is a depth finder. This is a real asset when fishing larger lakes. Areas that look shallow can, in fact, be the edge of a hill with deep water mere feet from the bank. 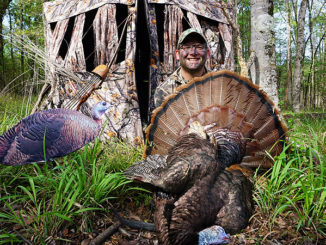 Also, locating fish and bait hiding down in the timber or under the vegetation,can spell the difference between success or a skunk. Watching the screen as you move along can show bait as well as a depth range where the fish holding. Fishing these larger lakes can be intimidating for kayak anglers. A great way to save wasted energy and increase your odds is to study Google Earth before your trip. 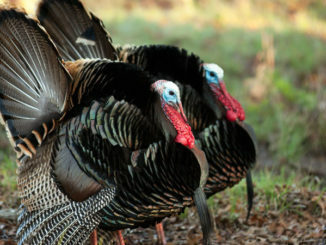 You can get a bird’s eye view to help plan your route and target a preferred area. It still may take several trips for kayak anglers to develop productive patterns and preferred areas, but this advanced scouting increases your odds of success. No matter which direction you choose to go, fish your way there. There is no sense in passing up fish that can be found by simply casting as you move. Some of these lakes have areas of flooded timber. Some is visible, but oftentimes it is not. This is not a problem for those that are paddling, but those with pedal-powered kayaks should be aware of unseen obstructions. Deliberate, slow travel is advised to avoid damaging your drive system. Although the water is generally clear, these stumps seem to appear from nowhere — and there is no give when you hit one. Slowly moving along allows you to safely pedal your ‘yak without risking damage. If you want to work concentrated areas of standing timber, it is best to simply use your paddle as you fish your way through. Some of these lakes are within state parks, and offer on-sight camping and cabin opportunities where you can stay overnight within close proximity to the water. Others have marinas and commercial campgrounds nearby that offer similar options. Whether a day trip or a long weekend stay, don’t shy away from these lakes — you might just miss out on some of the states’ best freshwater kayak fishing.